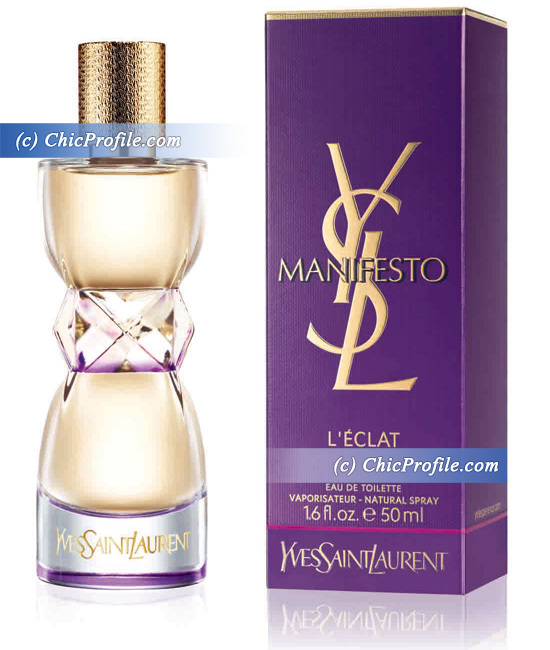 Yves Saint Laurent launches in the Spring of 2014, Manifesto L’Eclat Eau de Toilette, a new hymn of bold femininity, the signature scent of Manifesto reinvented and transcended by a singular, captivating and provocative freshness. American actress, Jessica Chastain is the face of this new advertising campaign created by photographers Mert and Marcus. With YSL Manifesto L’Eclat EDT, perfumers Anne Flipo and Loc Dong have created a new take on the famous, addictive green note of Manifesto. They meticulously and skillfully faceted it to transcend its personality and reveal a sparkling, dazzling, even more captivating freshness. The bottle like the scent, bares it all. Still crowned with the chiselled gold cap, the glass bottle becomes as crystal clear as a splash of light. An amethyst line highlights the base to irradiate the diamond-facetted belt, in a subtle play of reflections and vibrations. For this new opus, creamy jasmine absolute cedes its place to a halo of airy petals composed of a jasmine-freesia accord. This luminous top note is powered by a delicious new green accord of tea, blackcurrant buds and essence of bergamot, exalted by Neroli essence, a natural ingredient radiant dazzling light. Obtained by the stream distillation of orange blossoms, this perfumer’s liquid gold, the star of the legendary garden of the Hesperides, becomes the precious signature note of Manifesto L’Eclat. The base note features the irreplaceable aura of vanilla, Tonka bean and sandalwood, elegantly enveloping the bouquet of white petals. An ambery, warm rush of cashmeran wood slices through the fragrance like a blaze of light. Are you familiar with the previous editions of YSL Manifesto Eau de Parfum and YSL Manifesto L’Elixir? If you’ve already tested one of the previous Manifesto fragrances and you loved it then you’ll be definitely checking out the new scent. basically, you are in violation of copyright. You are not the copyright owner of these images. Therefor you should not tag them, let alone mark them with (C) as if those images are your copyright. You are not YSL, and you are not the photographer. You are owning up their images without any right. They did not shoot them for CHICPROFILE. No they obviously didn’t shoot the photos for me and it’s obvious for everyone they are promo photos. I just used my watermark because I was the first to post the news and there are a few bloggers out there who never link back to the original source. I will replace the photos (without watermark) in a few weeks after these promo photos will be released world wide. Thank you, for your honesty in always giving proper credit when you use photos of various cosmetic companies. I love your blog and I think you do a fantastic job.